← Who can charge God’s elect? Today, while searching for Puritan quotes I came across one that really hits home. It is from Irish writer Richard Steele. I love how some of these guys look like aging 80’s rock stars. (see image to right) Anyway on with the quote. It is from Steele’s writing “A Remedy For Wondering Thoughts”. The belief that God is everywhere should persuade us to sin nowhere. We should not delude ourselves into thinking that because we are alone physically or in thought that we are outside of God’s reception. God’s is with us. Christ is in us. Wherever we go, God is there. So a word or actually a phrase to myself and other brothers and sisters: Don’t go there! Fantastic quote Barry. Extremely convicting! Yep, I do remember using that line. It is one that is very convicting to me at times. I still need not forget who is with me. Thanks buddy. 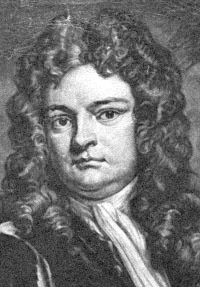 The kudos belong to Sir Richard Steele, and of course all praise to our God.